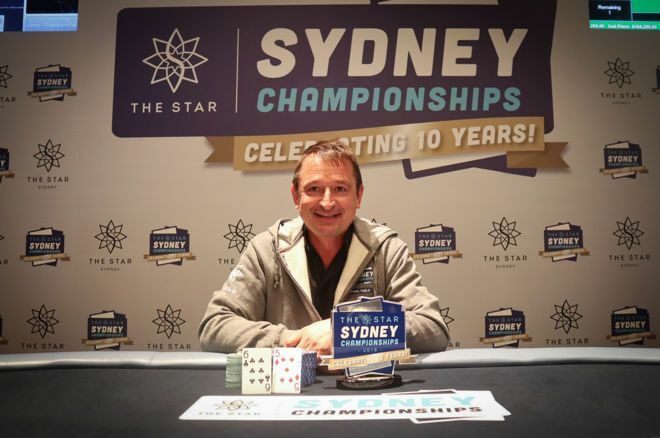 Nebojsa Blanusa came from behind to win the 2018 Sydney Championships Main Event for A$314,265. Australia's Nebojsa Blanusa finished on top of a 522-entrant field to win the 2018 Sydney Championships Event #12: A$3,000 Main Event at the Star Poker Room for A$314,265 ($231,827). This marks the second huge victory for the Aussie in the past year at the Star Poker Room. In December, Blanusa won the WSOP International Circuit Event #11: A$660 No Limit Hold'em - Omaha event for A$31,677 ($24,277). According to the Star Poker Room Blog, the final day began with 12 hopefuls battling it out in hopes of lifting the trophy and claiming the massive top prize. Dhiya Majeed kicked off the action with the chip lead, while Blanusa held the second shortest chip stack. The final table began after Jason Quarmby ran his pocket sevens into his opponent's pocket nines. Charlie Hawes snagged the chip lead by the time the final table began with Blanusa chipping up to a fifth-place chip stack. Mohammed Elkassir was the first player eliminated in ninth place for A$29,158. He three-bet jammed pocket queens and was unable to improve against Lam's pocket aces after his opponent called. Next to go was Michel Bouskila in eighth place for A$36,642 after he lost a race. Bouskila open-jammed ace-king and the board didn't help him after Lam called with pocket eights. Lam then eliminated his third straight opponent at the final table. Martin Ward jammed pocket tens and was called by Lam with ace-queen. Ward was eliminated in seventh place for A$46,698 after aces appeared on both the flop and turn. After the hand, Lam appeared to be in control with one-third of the chips in play. Michael Levy jammed ace-three and was called by Blanusa with pocket jacks. Two aces appeared on the board to give Levy trips, but Levy hit the rail anyway in sixth place for A$60,364 with Blanusa improving to a full house thanks to a jack also appearing on the board. Suzy Khoueis, who celebrated her birthday with a back to back final table appearance after she took sixth place in the Main Event last year for A$57,000, was eliminated in fifth place for A$79,131 in this year's Main Event. She got it in good with pocket kings against the ace-queen held by Hawes but was ousted after an ace spiked the flop. Majeed was able to parlay his starting day chip lead into a fourth-place finish to collect A$105,220. He jammed king-four and the board didn't help him overcome the aces held by Lam. Lam then eliminated his fifth opponent at the final table. Hawes hit the showers in third place for A$141,935 after his ace-seven was no match for Lam's big slick. Lam entered the heads-up battle against Blanusa with a 2:1 chip advantage and quickly extended it to a 6.5:1 advantage. Blanusa then doubled up twice and turned the tables ran up his stack to double that of his opponent. Both players had huge hands on the final hand of the tournament. Lam with queen-jack suited held a flush and called a jam from his opponent. However, this wasn't good enough as Blanusa held a full-house with six-five and Lam was eliminated in second place for A$194,290.